From this course, we have learnt that literature is a wonderful masterpiece. 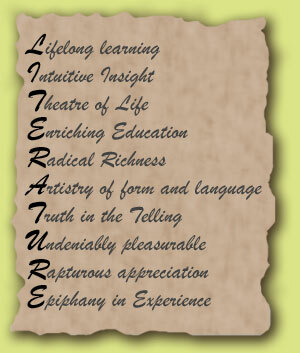 We discovered that literature is something meaningful because it consists of literal and figurative meaning. Without literature, we might not have any knowledge on our poet and author, classic words and languages, and people's culture and beliefs in the ancient time. Through short stories, we realized that many culture in the world are connected to the art of literature. Before this, we think that literature is mostly about love only. However, after guided by our lecturer, Mr. Camillus Ong, we are very interested to learn literature deeply. Apart from that, we managed to develop our talents in creating and reciting poem, act based on the short stories and drawing. Our lecturer always encourage us to write our analysis of poems and short stories in blog hence, it develop our interest in blogging. We used various techniques of learning literature. Moreover, the uses of technology is very necessary to enhance students' interest, because it can help us to exchange ideas and share information with other students. Technology is very important for us to search for learning materials that is needed for this course. In addition to that, opinions on literature are never right or wrong. We can write anything but if only there is a reason for it. Finally, literature is my faithful teacher.